Vicki Lawrence and Mama will perform a one-night show in Branson, MO at the Legends Theater during Monther’s Day on May 12, 2019. To enjoy this hilarious show with the duo that is truly unforgettable, make sure to watch this limited engagement Branson show at the Legends Theater. Vicki Lawrence and Mama are bound to impress everyone in the audience. This intriguing show with comedy and singing and all-around fun show is sure to give inspiration and great entertainment to all audiences. So, don’t miss out this fiery comedian, actress, and singer when she visits the Branson Stage. For one night only, you'll be entertained by the hilarious comedy of Vicki Lawrence herself. Vicki Lawrence started performing on stage at a young age. While she was in high school, she got the opportunity to join with the Young Americans musical group. As a member of the group, she was able to go on tour and perform at the Oscars. She has also played on the Andy Williams Show. Her acting career started after she competed in a local pageant where a newspaper reporter called her ‘a young Carol Burnett.’ After she sent a fan letter to Burnett, she came to see the show. At that time, Carol Burnett was in search for an actress to play a younger version of herself. Vicki was eventually chosen and started working on The Carol Burnett Show. After the seventh season of the Carol Burnett Show where Vick Lawrence was a part of the legendary cast, and at the tender age of 24, she created her most endearing character to date, Thelma Harper, or “Mama” as she is better known to her fans. After the Burnett Show, she starred in Mama’s Family, which consistently topped the ratings for the entire six seasons run of original shows. Vicki has attained so much popularity among television viewers. It’s a rare opportunity in your lifetime to see a two-woman show starring just one leading lady, the incomparable Vicki Lawrence. As a talented actor, singer, and comedian, Vicki is really ‘three’ stars rolled into one. Vicki is a seriously funny and lovely lady, who happens to be hiding in sensible shoes and dresses that saw their best days in the 1950s. 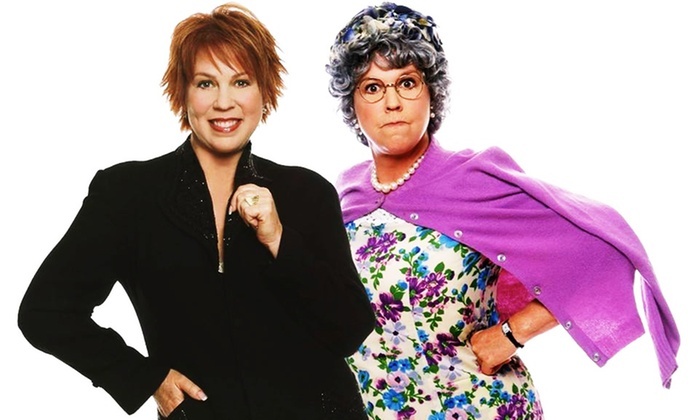 Whether you want to see the show to enjoy Vicki Lawrence the singer, or the actor, or a hilarious comedian or plain Thelma Harper, one thing’s for sure; you’re going to have a wonderful time of your life at Vicki Lawrence and Mama – A Limited Engagement Two Woman Branson Show. The comedic performance will start with side-splitting stand-up comedy followed by an appearance by “Mama.” So get ready to laugh until you move to the edge of your seat. If you miss this limited engagement show, don’t worry, Vicki Lawrence and Mama will return to Branson for a special appearance on Veterans Day. With this limited engagement Branson show at the Legends Theater, singer, actor, and comedian Vicki Lawrence will share her observations on life, a bit of music, and a boatload of comedy. So be there on this unforgettable Night with Vicky Lawrence and Mama.